Is riding a motorbike more tiring than driving a car? Is riding a motorbike more tiring than driving a car? Is riding a motorbike more tiring than driving a car? Correct. Riding a motorbike is more tiring than driving a car. 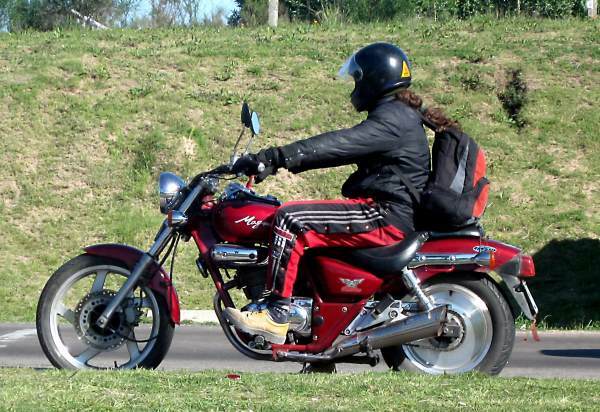 A motorbike requires you to use your weight to change the bike's direction. The riding position on some motorbikes (sport bikes) puts more weight on your shoulders; cruisers and touring bikes don't have this problem as much. The riding position with legs bent can cause cramp. The wind buffets the rider all the time and the rider has to hold onto the handlebars. The worse the weather, the more difficult it is to ride a motorbike. Riding a motorcycle requires more concentration than driving a car; the assumption should always be that other motorists haven't seen you and therefore you need to be constantly vigilant about your own visibility. The weather can sap your energy either through being too hot or too cold. It's difficult to take on fluids while you are riding so riders often find themselves dehydrated which causes loss of concentration. Motorbikes can be noisier (up to twice the permitted sound volume as a car - 100dB [or decibels] vs 90dB) and noise creates fatigue. Most cars are between 60-65dB inside at 90kph whereas a motoribke can be around 90dB when cruising. 90dB is eight times louder than 60dB. This is why it's important to wear earplugs when you are riding a motorbike. When you stop you have to balance the bike. You should aim to stop for a break every 150km or two hours. Stretch, walk around, have a drink and or something to eat. If you feel tired, have a snooze off the bike.